Probably the most well known participant-driven meeting design is Open Space Technology, usually abbreviated to just Open Space. Devised by Harrison Owen around the same time as Conferences That Work and presented in his 1993 book Open Space Technology: A Users Guide, this simple approach has become a popular way for participants to choose and discuss topics during their time together. However, I think that Open Space does not work well for many participants. This has been corroborated informally over the years by every facilitator that I’ve spoken to who has used it. Here’s why. Open Space session topics are determined by individuals who stand up in front of the entire group and announce their chosen topic. Generally, this is much easier for extroverts, who have few difficulties speaking to a group extemporaneously, than introverts who tend to shun such opportunities. The end result is that introverts are largely silent during the opening process, and the subsequent Open Space sessions are biased towards those proposed and often dominated by a comfortably-vocal minority. Given that introverts are reckoned to make up ~25-50% of the population (higher in some industries, such as information technology) this is not good. 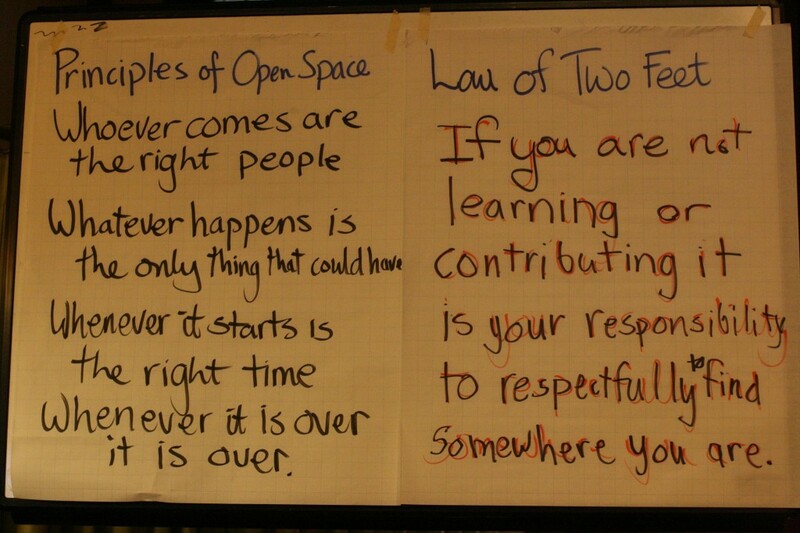 A facilitator told me recently about her experience at an Open Space conference she was running. The acknowledged expert on the conference topic was present, but he was so uncomfortable with the process that he hardly spoke during the entire event. We know that introverts can bring much to the table (for example, there’s research that indicates that introverts do better on intelligence tests). Using participant-driven process that favors extrovert participation is a disservice to everyone present, not just the introverts. In my opinion, it’s a significant shortcoming of Open Space. How can we engage introverts at participant-driven events? Being a recovering introvert (according to the Myers-Briggs Type Inventory these days, I am a weak extrovert, but I didn’t always test that way) has sensitized me to the needs of introverts at participant-driven events, and the Conferences That Work design contains numerous small features that largely level the playing field. For example, creating a safe environment is vital for attendees to become participants at an event. Conferences That Work’s six explicit ground rules provide a safe, confidential environment that makes it easier for introverts to share at an event. Another example: I have participants answer roundtable and personal introspective questions alone, in writing before they share their answers. Asking for written responses allows introverts to do their reflective work internally, rather than externally as extroverts prefer. One more important feature of Conferences That Work is that during the roundtable at the start of the event: a) everyone is invited, in turn, to share; and b) each person is given the same amount of time to speak. (Yes, I have a timekeeper present.) This prevents extroverts from monopolizing group time, and models that sharing by all is an integral part of the event. Conferences That Work is not Open Space! Although Open Space and Conferences That Work are both participant-driven designs, there are significant differences between them. Perhaps the biggest advantage of Open Space is that it can be used in a short time period; a few hours are often enough time to do useful work. For events lasting one-and-half days or longer, however, I believe that the additional structure of Conferences That Work creates a more intimate, powerful, and useful experience for participants. Including introverts! This entry was posted on Wednesday, March 28th, 2012 at 3:17 pm	and is filed under Event design. You can follow any responses to this entry through the RSS 2.0 feed.You can leave a response, or trackback from your own site.